Bloodletting (or blood-letting) is the withdrawal of blood from a patient to cure or prevent illness and disease. Bloodletting was based on an ancient system of medicine in which blood and other bodily fluid were regarded as “humors” that had to remain in proper balance to maintain health. The withdrawal of anger will eventually allow me to remain in proper balance and maintain my emotional health. But the process is uncomfortable at best, painful to endure at worse, and not a lot of fun for those who happen to be around for it. I hate negative people but I find myself seeking them out to fuel my anger which is really just a reflection of what I dislike most about myself at the moment. Maybe the leaches just haven’t latched on hard enough yet or the cuts are too shallow? Perhaps I need to step up my emotional bloodletting to truly cleanse and balance my soul? This entry was posted in memoir. Tagged anger, blood letting, Bloodletting, depression, emotions, leaches, life after 50, memoir, New Hampshire. Thank you Yayo. We all work through issues in life, the key is to learn from the process, right? Wishing peace for you. Being out of balance is a hard way to live. Sometimes I feel so, so good about who I am, where I’m at in life, pleased with my successes and accomplishments. At other times, not so much. Currently I feel certain resentments and frustrations, the source of which I know I’ll feel differently about later in life when she’s gone but like you, I need to learn to ‘leach’ it out of my system. Thanks for the perspective, Martha. Yes Julie, we will be fine as long as we learn the lesson along the way. Anger is such a wasted emotion. Thanks for understanding and commenting. It’s the cold, the white shrouding everything …and lack of outdoors. 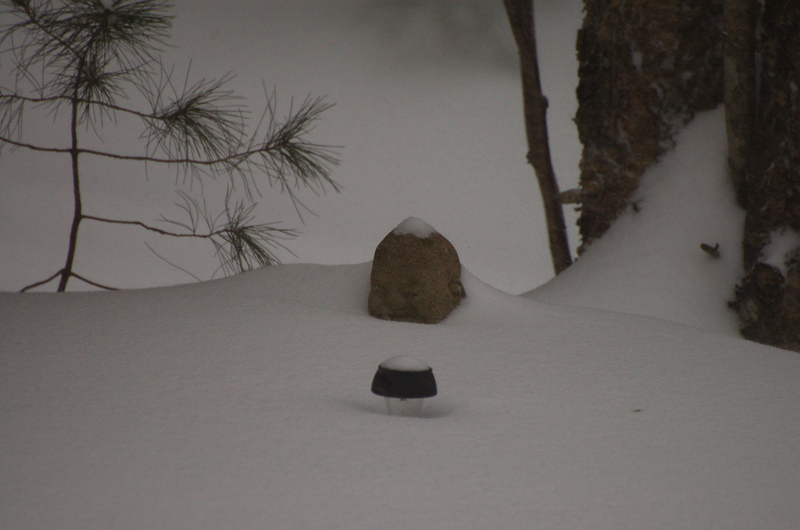 Quite a zen-like image…except for that small pine tree fan dancing for attention. Maybe we should all just turn the music up really loud and dance…or make odd attempts at it? Absolutely, Phil! Brilliant! Dancing would be the perfect answer to feeling blue. Thanks for your wise observations! Martha, read 10% Happier by Dan Harris , it will help! Sorrry that you are going through a tough time! Sploriness rules at times. And when I kicked the piano in sheer frustration I forgot i had no shoes on – Green Day – American Idiot – is a good one to let off frustration. Nothing meant by the title, it just is good!! Thank you Cheryl. Venting, writing, getting it out of my system usually helps. Feeling better already! Thanks Susan, those waves always have an upside! Have you ever tried meditation. I always thought that it “wasn’t me” until I tried it and it has really helped me in a whole bunch of ways. There is a site called Meditation Oasis that does guided meditation podcasts that are free, if you’re interested. I am so humbled by all the heart-felt responses I have received from this post. I never thought I was a “YOGAMEDITATION” kind of person but I do find reserves of strength from both. I am really feeling much better having poured this out and let it go in the ethernet. Thank you Allen. Happy Friday the 13th! I guess we all feel that way at times Martha. For me a long angry walk is usually the answer. Stoking off the feeling I usually come home feeling much better and more positive. Exercise will excise the anger! Love it!